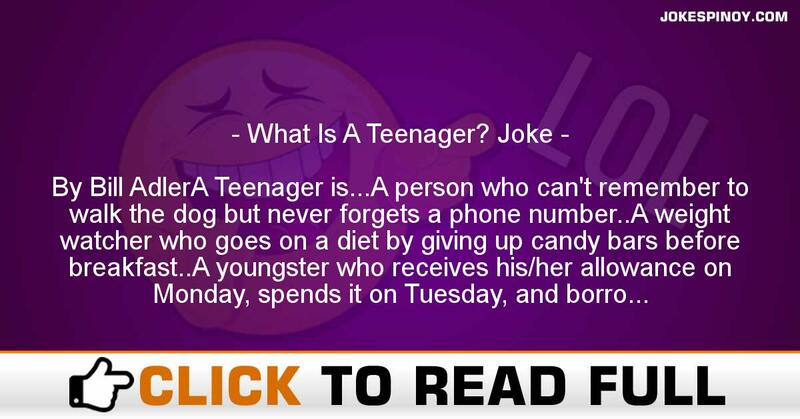 By Bill AdlerA Teenager is…A person who can’t remember to walk the dog but never forgets a phone number..A weight watcher who goes on a diet by giving up candy bars before breakfast..A youngster who receives his/her allowance on Monday, spends it on Tuesday, and borrows from his/her best friend on Wednesday.Someone who can hear a song by Madonna played three blocks away but not his mother calling from the next room.A whiz who can operate the latest computer without a lesson but can’t make a bed.A student who will spend 12 minutes studying for her history exam and 12 hours for her driver’s license.A youngster who is well informed about anything he doesn’t have to study.An enthusiast who has the energy to ride a bike for miles, but is usually too tired to dry the dishes.A connoisseur of two kinds of fine music: Loud and Very Loud.A young woman who loves the cat and tolerates her brother.A person who is always late for dinner but always on time for a Michael Jackson concert.A romantic who never falls in love more than once a week.A budding beauty who never smiles until her braces come off.A boy who can sleep until noon on any Saturday when he suspects the lawn needs mowing.An original thinker who is positive that her mother was never a teenager. ABOUT US : Laughter is the greatest medication as the old saying says, we at JokesPinoy.com will provide you with all the comical filipino quotations and photographs in tagalog language. Back in 2013, a group of Filipino OFW (Overseas Filipino Worker) got bored and they attempt to look for some funny quotations on the net simply to have fun but sadly most of the websites they discovered on that time are having an old jokes and have no interaction with the users. From that instant, they then got an idea to build their very own jokes website and let other users to give their jokes or opinion with the existing jokes. After the funds and ideas accumulated, JokesPinoy.com was born, a website that let the user share their jokes and let them have conversation with other users as well. Since the website has been launch, a large number of visitors are coming each day to read jokes and have fun on the website and as well as giving their opinion on the jokes they read. We hope from JokesPinoy.com this website may give you some smile and happiness, Life is Short so have fun on it. DISCLAIMER: Some of the jokes, pictures and videos found in this site are not created by us, they are created by our users or they just get it someplace in the net just like 9gag, youtube, metacafe, vimio and etc. We respect copyright info which is posted here including funny pictures and funny videos. If encase there are files posted here in our site which is owned by your and you don't desire to share it to anybody afterward fell free to contact us to remove it. Majority of the language used on this site was in tagalog and some are bisaya that are both filipino language which originated from Philippines, if you need to interpret the joke to english you can used an online translator to interpret it from tagalog to english.